A premium edition of the “Kids’ Travel Guide – Italy & Rome”. • All about Italy, especially for kids: its geography, flags and symbols, and fascinating history, as well as Italian culture, food, and even some useful word in Italian. • Everything about Rome: its relevant history, Rome map, transportation system, and many fascinating facts, and things to do in Rome. 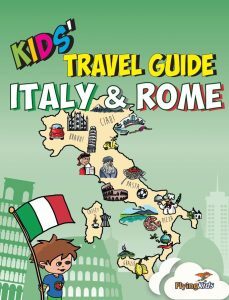 • Leonardo, your kid’s tour guide, will take the kids to the famous Rome attractions and make it interesting with fun fact, “juicy information,” quizzes, special tasks, kid’s diary, and coloring pages. • You, the parents, are invited to participate, or to find an available bench and relax your Rome vacation while you enjoy your active children. • When you return home, the Rome guide and diary will become a souvenir of your travel that the whole family can treasure for a lifetime. Fun, educational, interesting and engaging your kids in the family vacation. – Kids’ Travel Guide – Rome—all about Rome and the best sites for kids. – Kids’ Travel Guide – Italy—all about Italy, no matter which area you visit.